My role on-board True North is guide and ship's photographer. When we are involved in diving ops, I am also the dive coordinator. I take guests on all sorts of activities including sightseeing, fishing, snorkelling and diving. If there are any guests on-board with an interest in photography or video, it’s my job to help-out as much as I can. I let them know about specific photographic opportunities that are coming up and help them to understand how they can get the best shots. We always have guests with different photography skill levels on-board, so I offer a photography tutorial on the second or third day of each trip. I cover everything that is needed from the basics of how a camera works, to how to take better photos using an iPhone, right up to more advanced tasks such as editing images taken with a DSLR. I recall one occasion when we had well-known Australian photographer Ken Duncan as a guest. He wanted to get a sunrise shot of King Cascade. Because of the tides, we weren’t able to get him to the waterfall at sunrise. So Ken suggested “Drop me up there on the high tide, I’ll stay there all night so I can get the sunrise shot”. I was impressed with his dedication and decided to go with him. Ken, myself and some film makers flew to the Cascade in the ship’s heli and we slept on a rock opposite the falls. At sunrise we all got some fantastic shots! Here are some of my favourite True North photographs. 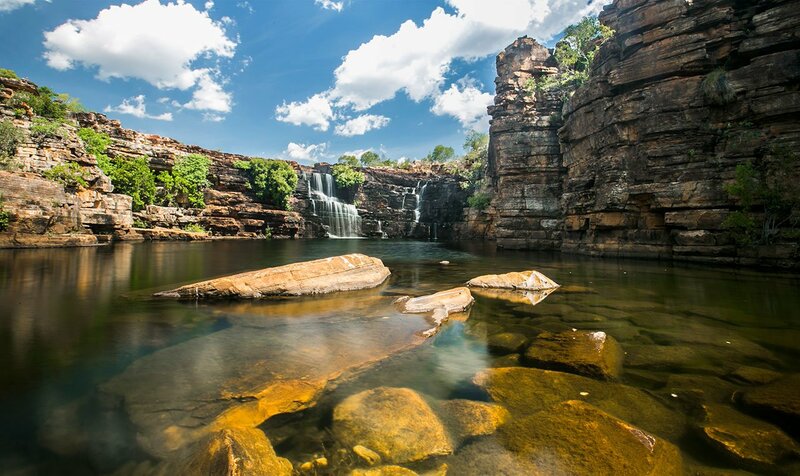 This is Eagle Falls, which is one of our heli picnic sites. We have a picnic here on all of our Kimberley cruises. It’s a pretty special spot, because it’s a secret location that one of our heli pilots discovered more than 10 years ago. No one else seems to go there. It’s exclusive to the True North, which is one of the reasons why I love this shot. You can only get a shot like this if you’ve been on a heli picnic on the True North. The shot was taken at the start of the wet season. I was shooting with my Canon 5D Mark III and a Carl Zeiss 20mm Prime f1.8 lens. The photo is actually two shots stitched together and I had to use a tripod with a neutral density filter with about 8 stops of neutral density. That way I could slow the water down to give it that milky look. The location is so special. Where we land the helicopter is close to the main picnic area. When you walk up the back of the picnic site it just opens up like a rain forest and you can just see this beautiful lagoon. It’s just really peaceful and simply stunning. It’s only accessible by chopper which is part of the reason why it is such a special place. If ever I win the lottery, I’m going to fly all my mates over from the UK, take a cruise on the True North and camp at this spot. It’s really high up, so there are no crocs and it’s safe to swim. 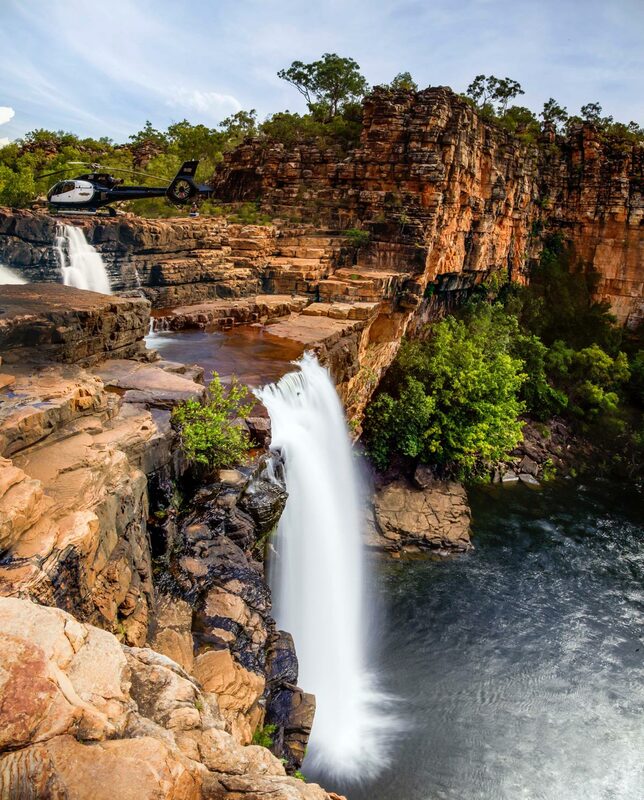 This is Eagles Falls at the end of the wet season, a powerful image that really sums up the magic. The heli whips-up the water as the guests disembark and they spend the rest of the day on cloud nine! The crew arrive beforehand and set-up the shade and the barbecue. The guests come in 6 at a time and have the most amazing day. I’ve probably been up there 60 times but every time I go there I just love it. The main challenge with getting this shot was the light. I had to wait for the light levels to drop and catch the last heli back to True North. I used a 50mm prime lens with a slow shutter speed and a neutral density filter so I could get the waterfall looking nice and milky. I tried the shot a number of times earlier on in the day but the light was harsher and the whole image was just getting blown out. The final image is made up from 6 images stitched together, so I could capture the whole waterfall. This photo was taken at the Kambaraumba stilt village. It’s right up the back of the Sepik River. It takes us about 7 hours to get there on the True North and then another hour in the expedition boats. Many years ago the community was flooded out. Rather than moving out of their tribal area they built their huts up on stilts. Fish and sago are staple foods and they are really happy people. When we arrive they greet us in their dugout canoes. They’re always super-happy to see us. We donate food and medical packs and try to help out with school and sporting equipment. I think this portrait captures some of the experience. There are flowers in the foreground, reflecting the happiness we see when they greet us. The portrait also gives you some sense of what life is like in the village. For me it is pretty raw, this is a community living on the edge. I used the Canon 5D III with a 24 to 70 mm lens. That’s my favourite lens for portraits, the 24 to 70. You get f2.8, so you get a really nice shallow depth of field and a pretty fast shutter speed as well. The Sepik Soiree is my favourite trip for photography. I love the amazing portraits at the villages, the aerial shots from the helicopter and also the fantastic underwater shots. In the 10 days we cover a lot of bases as well as getting beautiful landscape shots at sunrise and sunset. 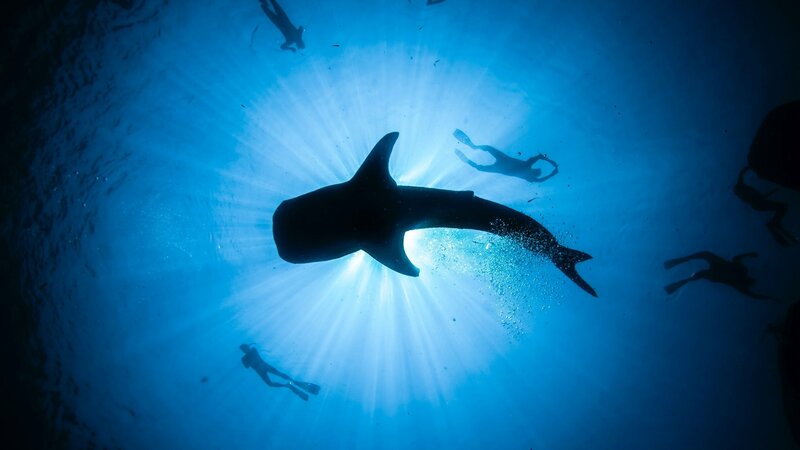 This silhouette of a whale shark was taken at Cenderawasih Bay while we were diving from one of the bagans. In Cenderawasih Bay there are several fishing villages. The fishermen build bagans, which are basically like floating pontoons. They then anchor the bagans in the middle of the bay and on-board they have these rickety old generators and a series of night lights to help them catch bait fish in nets. Over the years, the whale sharks have worked this out and come to feed on the bait fish. When I shot this photo there were about 11 whale sharks swimming around our bagan. I don’t think you get to see that many at one time anywhere else in the world. I was using the Canon 5D III with a 16 to 35 Canon L-series lens, which is f2.8. I was shooting super wide at 16 mm in an Aquatech under water housing. The biggest challenge with shooting Whale Sharks is getting the whole shark in the frame. They’re so big and if part of the tail or fins go out of frame you lose the impact. I had this silhouette shot in my head for months. I wanted to have people in it as well to show the Whale Sharks are gentle giants, really friendly creatures. For this shot I went down to 25 metres and waited for just the right moment. 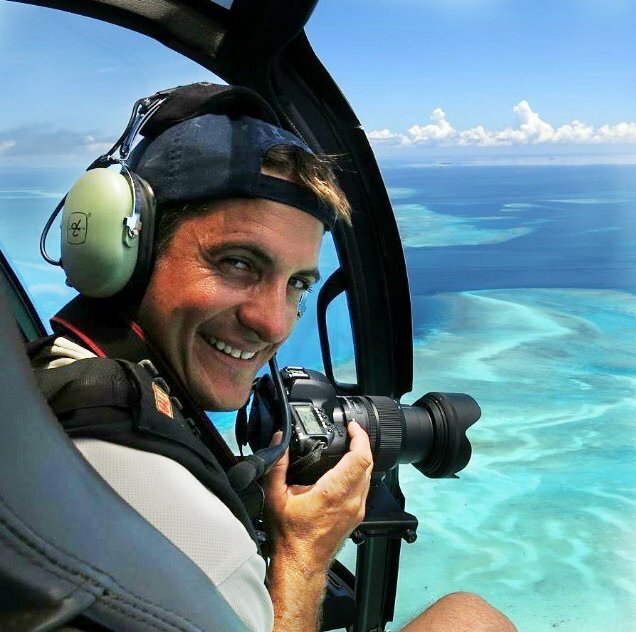 This image was taken on a helicopter flight over Bougainville, looking for anchorages and places to visit on one of our upcoming expedition cruises. We flew over the top of the Bougainville mine pit. Before we went I did some reading about the history of Bougainville and the conflict. It really moved me. They were at war for such a long time and the copper mine was a major causation. One of my favourite things about photography is taking abstract aerial shots. This particular shot is just off to the side of the mine - the biggest man-made hole in the world! 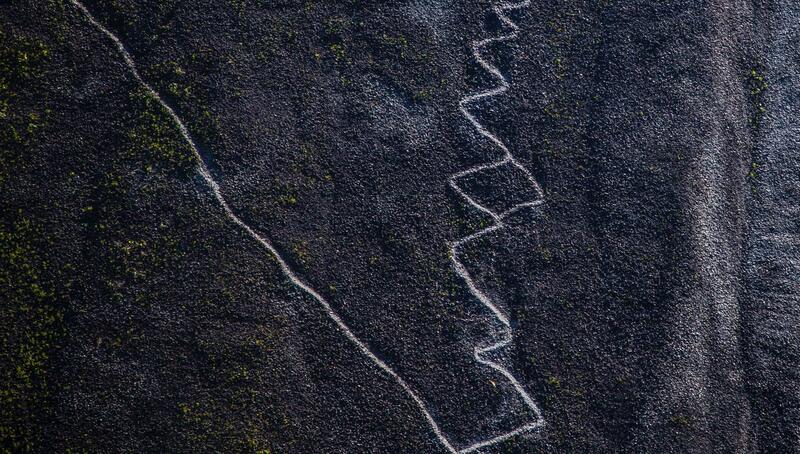 These walking tracks were at the edge of the mine. 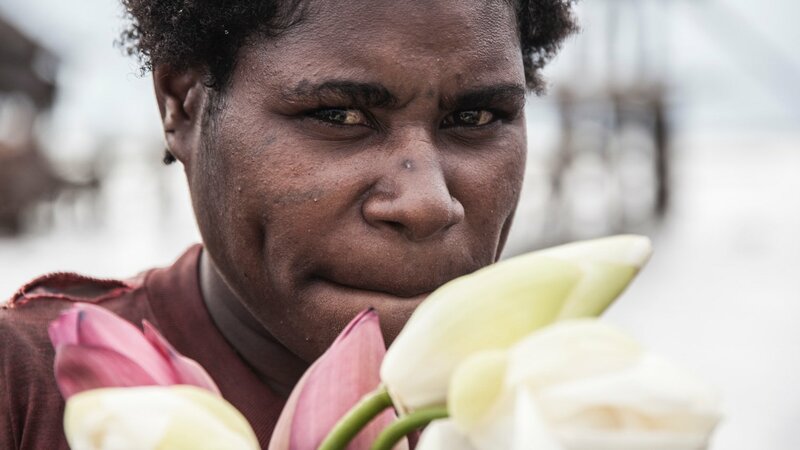 I feel this image tells a Bougainville story - a dark story at the edge of a very big hole! I like the image as an abstract and I feel there is a message in its story.